2014/FEBRUARY/12 There have been widespread reports of heavy snowfalls in central Japan. 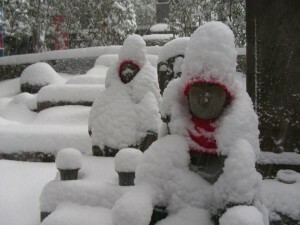 The heaviest snowfalls near us have been in the alpine areas of Gifu and Nagano, and in the Tokyo area. We have received quite a few emails and telephone calls from family and friends of our students and staff. We thank you for your concerns. Please note that we are completed unaffected by this and all classes and field trips have continued as normal. While the snowfalls this week where heavier than usual, please note that there have been no disruptions at all to local transport or other services. We are instead looking forward to even better skiing conditions into the spring. Hakuba awaits! There are snowfalls in Aichi every winter, but in the lower lying areas of the prefecture (such as Nagoya and Okazaki), the snow usually melts within about 24 hours. In the alpine terrain northeast of Okazaki and Toyota, there are some small ski-fields and good snowshoeing areas, though the snow depth is not as good as in Gifu or Nagano.